Blue Knob Ski Patrol (BKSP) has always been a family oriented patrol. Our skills have been honed by having some of the most difficult ski terrain within a three hour drive of Baltimore, Washington, and Pittsburgh. We switched over from Sure-Stops and Akias about the time Carole joined. 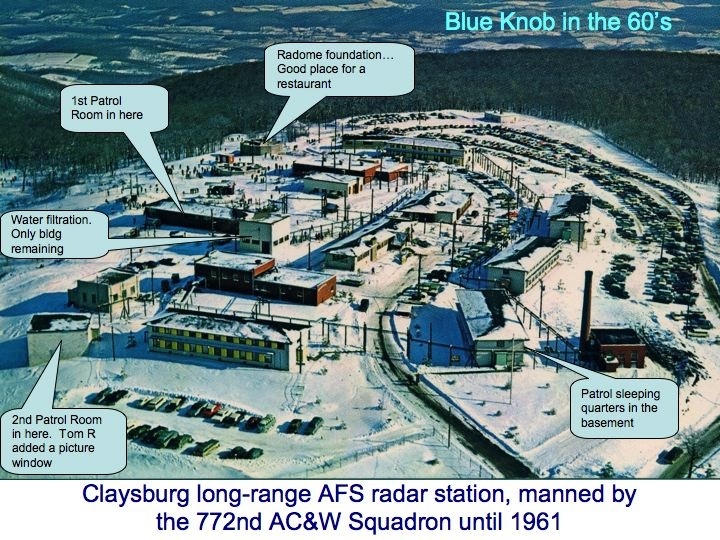 Blue Knob would average 7 lift evacs a year in the '70s. We had no snow-mobiles and would bring all but backboard cases up on the lift. Imperative that we knew how to get an injured skier off a stalled lift. We built our Patrol Rooms as the area upgraded the facilities. Anna Grisso, an architect in real life, would design each new room and we'd all bring hammers and nails. We don't do this any more! Tom and his daughter put the finishing touches on two new backboards. Are the skis long enough? Jay Sanders can never find ski's long enough. Back then 215cm were shorties for Jay. Jay met Carole waiting in the lift line (yes, we really did have lift lines). Two patrollers! What a catch! Jay was Patrol Leader from 1978-1980. 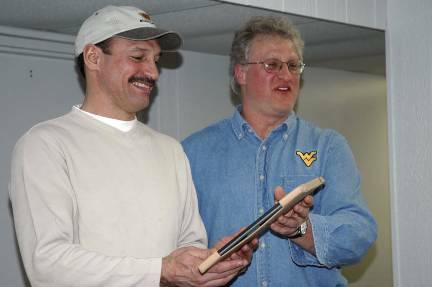 Larry Athen & Tom Hillegas share a quiet moment. We lost Larry in 2006 and Tom in 2008. 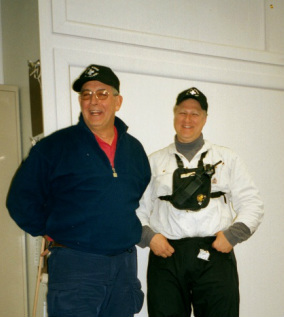 Larry was Patrol Leader from 2000-2. Several toboggan styles were used before the Cascades were available. The photo is of patrollers in rust jackets, long before red jackets were used. Circle M (now Mountain Travel) course. One of the early "pros". Came up through the volunteers after being recruited by Ozzie Wilkenson. We're still trying to get him back! Skiing was not the only required skill for patrollers in the '70 and '80s. Tyler was part of the Eastern Division hierarchy. He helped Blue Knob get its patrol off the ground in the 60's. He patrolled into his 80's and is sorely missed. Ozzie was Patrol Leader in the '70s. 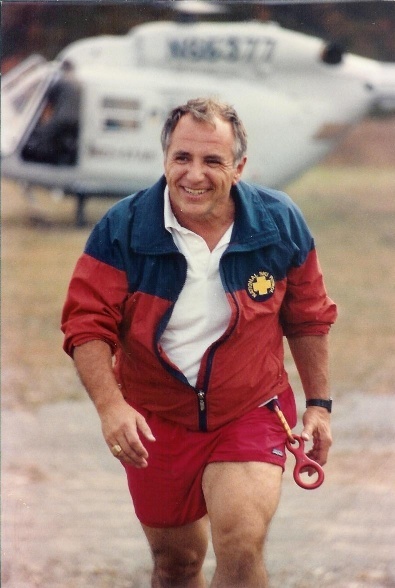 Roe Calabrese was also a Patroller. Beth supported Tom Rawcliffe's patrolling.